The Fainting Forever Liss mask has a concentrated formula with Brazilian Keratin, D’Pantenol, collagen and amino acid synergy. The Forever Liss Hair Removal Ultra Moisturizing Mask features instant, anti-frizz, a super-effective action that acts to soften wires, leaving the super silky, soft and shiny. The Fainting Forever Liss mask has a concentrated formula with Brazilian Keratin, D’Pantenol, collagen and amino acid synergy. It recovers the yarns attacked by the chemistry, performing a deep hydration in the yarns, thus guaranteeing a reduction in volume and capillary alignment. Indicated for all types of hair really faints the wires. It instantly moisturizes by counteracting the volume and frizz by aligning the hair, leaving them super soft, moisturized and silky with an incredible light feel on the strands. 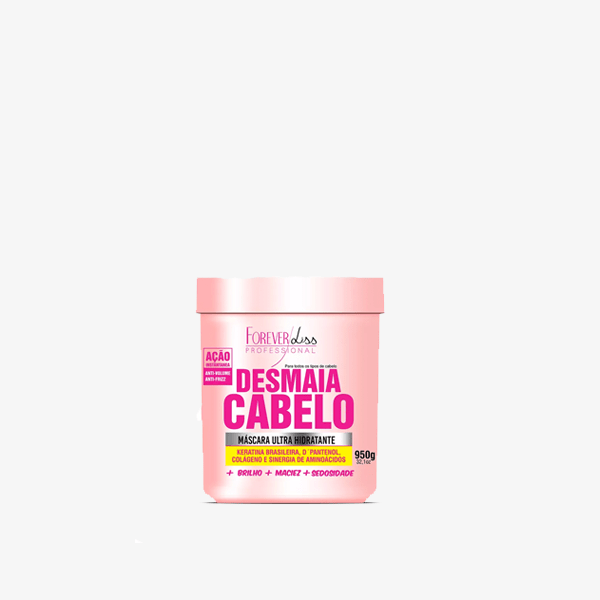 – Brazilian Keratin (Plant Origin, Corn, and Soy): Helps eliminate frizz, strengthen and reduce hair breakage, provides a smooth effect, has no power to smooth because it is not chemical but rather promotes the appearance of leaving the wires smooth, because it aligns the capillary cuticles. – D’Pantenol: Provides maximum moisture in the threads providing softness, leading to glowing and reviving the color of the threads. – Collagen: It maintains the shape of the hair and prevents the breaking of the threads, keeping them totally fortified, hydrated and nourished internally. – The synergy of Amino Acids: It reduces the aggression caused by the constant use of chemical and external aggressions like dryer and plank, keeping hair healthy and shiny. Extremely lined hair with shine, reduced volume, no frizz, silky, super light and soft. Apply the Mask Fainter Forever Hair Liss with damp hair throughout the area of the yarn. Comb with a comb until you notice uniformity in the application. Rinse normally and finish as desired.